Most applicants are elderly and desperate to see their loved ones before they die. North and South Korea started talks at a border village Monday on resuming the reunions of family separated by the Korean War in the early 1950s, Seoul officials said. 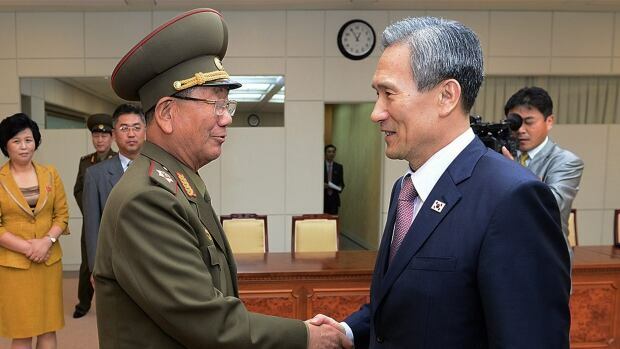 The talks among the rivals' Red Cross officials at Panmunjom were made possible after they struck a deal earlier this month that eased animosity that saw them threatening war. The standoff flared after a mine explosion blamed on Pyongyang maimed two South Korean soldiers. The highly emotional reunions have not happened since early last year. Most applicants are in their 70s or older and desperate to see their loved ones before they die. Many Koreans don't even know whether relatives on the other side of the border are still alive because their governments mostly ban the exchange of letters, phone calls or emails. The planned reunions are not a sure thing. The rivals have a long history of failing to follow through on reconciliation efforts. Some foreign analysts remain skeptical about inter-Korean ties because of speculation that North Korea will fire what it calls a satellite to celebrate next month's 70th birthday of its ruling party. Similar past launches triggered an international standoff as South Korea and other neighbouring countries called them disguised tests for long-range missiles. About 22,500 Koreans had participated in brief reunions — 18,800 in person and the others by video — during a period of detente. None were given a second chance to meet their relatives, according to South Korea's Red Cross. South Korean officials have long called for holding reunions more regularly and expanding the number of people taking part. North Korea is seen as worrying that doing so could open the country to influence from more affluent South Korea and threaten the ruling party's grip on power.